Like many survivors of the 1994 Genocide against the Tutsi, life took its toll on Justus Uwayesu. He was only three years old when both of his parents were killed. For years he lived at a dumpsite with his family until his life turned around. 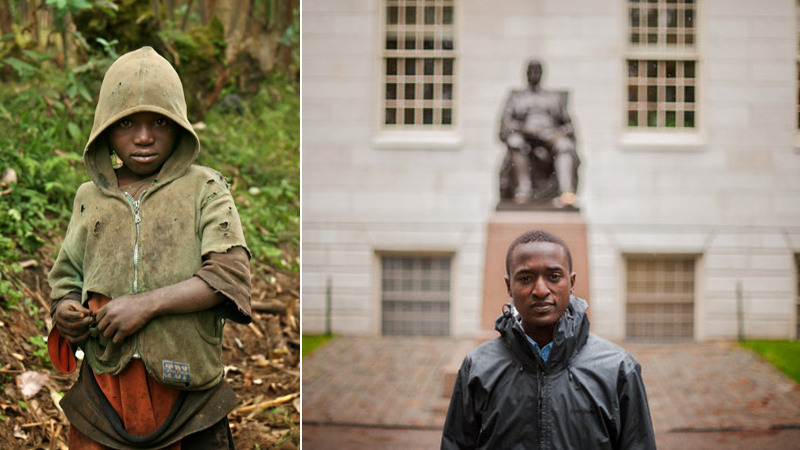 The former street kid and beggar is now a graduate in Economics from Harvard University, one of the most prestigious universities in the United States and globally. Uwayesu also recently got a Schwarzman Scholarship to study for a Masters’ degree in Global Affairs at Tsinghua University, one of China’s top universities. Even though his life drastically changed he never forgets the life of hopelessness he was in 24 years ago and for that reason, he founded Seven United for the Need (SUN), an organisation that cares for needy young people and street children. Born in 1991 in Nyamata, Uwayesu, like other Rwandans, is striving to leave behind the consequences of the Genocide against the Tutsi during which his parents were killed when he was only three years old. Uwayesu and his siblings fled to Kigali for refuge where Red Cross workers rescued them and accommodated them at the NGO’s premises in Kacyiru. “My brother, then 13, couldn’t afford taking care of us. We had to move to Kigali and look for help and, luckily, Red Cross put us together with other children who had lost their families,” he says. A relative soon adopted them but later abandoned them after famine hit Bugesera. In 2000, Uwayesu and his siblings found their way back to Kigali. “There was famine at the time which made us leave Bugesera. Life was too hard, we had nothing to eat, even grass was too dry to eat. The first person to leave the place was my brother and my two sisters, then I followed. I spent all day coming to Kigali by foot with a friend of mine”. With no place to stay, they found a new home at the Ruviri dump site in Nyanza, Kicukiro. “We had no choice other than staying in the dump. It was a home to a lot of street children. We would stay there eating rotten food that was in dustbins and would sleep in abandoned, burnt vehicles during the night,” says Uwayesu. After a year of enduring cold nights, American charity worker Clare Effiong, founder of Esther’s Aid, passed by the dumpsite one Sunday evening in 2001, and asked the few children that were around what kind of help they needed. Uwayesu’s request was to go back school. Effiong was surprised to hear a street child saying he wanted to study, a wish she could not reject. “The reason I said I wanted to go to school was not because I knew the benefits of studying. I thought the only thing that differentiates one child from another is that one is at school while another is not. Not being able to go to school was the most painful thing for me because it explained why some were called students and I was referred to as ‘mayibobo’ (street child). Some of the children from poor families were attending school without shoes. But their uniform made me feel different from them,” Uwayesu said. “I never knew what was happening at school. I only saw children running to school in uniforms and coming back at midday. It hurt that I couldn’t play with them or be like them because they never wanted me around them,” he recalled. Effiong adopted him and took him to school. He quickly adapted to school life despite having a bad attitude that had resulted from previous life as street child. Uwayesu skipped primary one and started from grade two at Petit Prince primary school but that never stopped him from getting good grades. He completed his high school with excellent grades. His excellent academic record earned him a scholarship to Harvard University. Uwayesu has never forgotten where he came from, a story he shares with his siblings who luckily all survived and are alive. He founded an organisation that cares for needy young people. The organisation was established 10 years ago when he was in Senior Two at Collège Saint André after he saw his colleagues in dire need for money. He shared his idea with classmates to raise some small sums to support needy students. The first seven students who supported his idea were happy that they were involved in a charity activity and immediately called themselves Seven United for the Needy (SUN), the name of the non-profit organisation to date. The organisation has played a significant part in promoting quality education by providing children from low income families and street children with school fees, materials, shoes, uniforms, and domestic animals as capital of future self-income generation. It also gets involved in community services in Rwanda through renovating old houses, building new ones, creating vegetable gardens, and giving domestic animals to low income families with significant life problems. The organisation, which started with seven youth members, is now growing into a large youth network in Rwanda with more than 1000 members from across the world. They join efforts to promote quality education and eradicating poverty in communities. “I want to encourage youth to help each other. The idea of founding Seven United for the Needy was not only about helping needy and street children with materials but also care for them so they can overcome the kind of situation I used to live. The organisation also promotes capacity building through connecting the youth with skilled and experienced people in different sectors to learn different subjects like leadership and entrepreneurship, human rights, health, culture, peace building and patriotism. Currently, the NGO operates in eight secondary schools in Rwanda, namely Collège Saint André Nyamirambo, ET. Save, Ecole Notre Dame de la Providence Karubanda, Gashora Girls’ Academy, Collège IFAK, ETO Nyamata, APARUDI Ruhango, and Kagarama Secondary School. It has also partnered with seven Universities, including University of Rwanda (College of Business and Economics, College of Science and Technology), Akilah Institute of Women, Kepler University, Adventist University of Central Africa (AUCA), University of Tourism and Business (UTB), University of Gitwe, and Kibogora Polytechnic, while the SUN’s youth also work with communities, mainly in Kamonyi District. The resources used in Seven United’s activities are generated by its members as well as financial support from the organisation’s friends abroad, especially in Kenya, United States and China. So far this year, SUN has taken eight street children to primary school, two in high school while six more were supported to pursue vocational courses, with the support set to increase in the coming years depending on the resources. “We really want these young people to be successful individuals so that they can be self-sustainable in the future. We are allocating a separate budget focusing on capacity building for them to prepare them have successful careers in their future,” Uwayesu said. Xavier Habineza, the co-founder and Country Director of Seven United for the Needy, said the initiative wants to expand so that more needy young people and street children benefit from it. “Since day one I have been in Seven United for the Needy, I realised that nothing is impossible as long as things are done through team work. Helping needy young people regardless of what we have is something I see as a foundation to their life. “Some have gone to school and are getting scholarships to study abroad under our recommendation; others who studied under our support have got jobs. Actually, we’re happy that their life is changing positively,” he says.